Beaches on Oahu offer more than sunbathing and people watching on powder white sand in the embrace of warm Hawaiian sun rays. With more than 125 beaches on Oahu from which to choose, from the powerful, pounding winter waves of the North Shore to the gentle shore break of Waikiki, there is a beach on Oahu that fits every taste from a sunbathing visitor to the more athletic windsurfer. With water temperatures ranging from 75°F to 80°F year round, it's easy to understand why locals and visitors alike are regularly drawn to the clear azure waters of Oahu. Many of Oahu's beaches are handicap accessible. The City and County of Honolulu have an excellent website with more information. The South Shore coastline is known for its many family beaches. Outings such as snorkeling, tide pooling, and swimming are great recreational activities for local families picnicking along the beach. Ala Moana Beach is the most popular among locals. Weekends, holidays, and summer months find the 76-acre park bustling with tennis players, joggers, rollerbladers, large groups of picnickers, kite flyers, fishermen, sunbathers, swimmers, and surfers. Waikiki Beach stretches one-half mile wide by two miles long along the shoreline of Waikiki. Often referenced as one beach, it is actually a collection of contiguous beaches, each with its own characteristics, and generally popular for swimming, sunbathing, snorkeling, and beginner level surfing. One of the most popular areas is Kuhio Beach, which includes a low retaining wall constructed to keep sand from eroding. Two of Oahu's most popular beaches are located on the southeast coast of the island. As seen in Elvis Presley's movie, Blue Hawaii, Hanauma Bay Nature Preserve's white sandy beach stretches 2000 feet and is lined with coconut trees. The crescent-shaped bay protects swimmers and snorkelers so that even beginners can enjoy the vibrant sea life. Sandy Beach is one of the premier bodysurfing spots on Oahu. It is 1,200-feet-long, with a bottom that drops abruptly eight- to 10-feet immediately offshore. This quick change in depth creates very steep and hard-breaking waves. On days with extremely big waves, most common during summer months, the sand erodes to form a steep shore, causing a strong and forceful backwash. The North Shore is best known for its world-class surfing and huge winter swells. During the winter months, waves reach heights of 25 - 30 feet. The summer months are in contrast with calm, flat conditions perfect for swimming and snorkeling. Ehukai Beach Park provides access to three popular surfing areas: Ehukai Beach Park, Pipeline, and Banzai. Ehukai Beach Park is known for its high winter surf, drawing dedicated bodyboarders and surfers. Pipeline is 100 yards to the left of Ehukai Beach Park. The steepness of winter waves causes the crest of the wave to fall forward, forming a near-perfect tube. Shooting the tube, or surfing inside a tube, is a prized challenge for experienced surfers. World championship surf competitions are held here because of the strong surf. Banzai Beach is located west of Pipeline. During the winter, surfers and surf fans blanket the beaches in hopes of watching a surfer catch the perfect wave. Strong winter waves make surfing competitions legendary at Pipeline and Banzai Beach. Ideal for diving, snorkeling, and surfing, Pupukea Beach has two major areas which are easily accessible: Shark's Cove and Three Tables. Shark's Cove is located at the north end, with its cave popular for day and night diving. Three Tables, named for the three flat sections of reef visible at low tide, is located at the south end of the beach. The best snorkeling is found near the tables, where fish and sea life are abundant. To experience the sea's bounty and treasures, diving is best outside of the tables. Sunset Beach is known around the world for its huge surf. With waves reaching 15-20 feet from September to April, swimming is only safe during the summer months. Regardless of the time of year, Sunset Beach attracts local surfers, sunbathers, and visitors. Waimea Bay is the world-famous home of the biggest waves for surfing. During the winter months, the waves provide bodyboarders with endless challenges. Besides the break beyond the point, the inner shore break reaches heights of 10-12 feet. The difference in Waimea's winter and summer surf is as drastic as night and day. During the summer months, leisurely swimmers enjoy the placid, crystal blue waters of the bay, while winter months attract world-class bodyboarders and surfers. The East Shore (windward side) has lush tropical beach settings, which are favorite locations for wind, kite, and sailing enthusiasts. Northeast tradewinds keep the coast cool 90 percent of the year. Voted the number one beach in the U.S. by Dr. Beach in 1998, Kailua Beach is the perfect place for family fun. With a 30-acre public park, there are countless ways to spend your day at the beach. Locals and visitors regularly picnic, sail, play volleyball, dive, swim, snorkel, and surf at this versatile park and beach. With constant winds, Kailua Beach is the best windsurfing area on Oahu. Lanikai Beach is a mile-long beach that is perfect for swimming, sailing, and windsurfing. Offshore, Mokulua, two tiny islands designated as seabird sanctuaries, are popular destinations for kayakers. 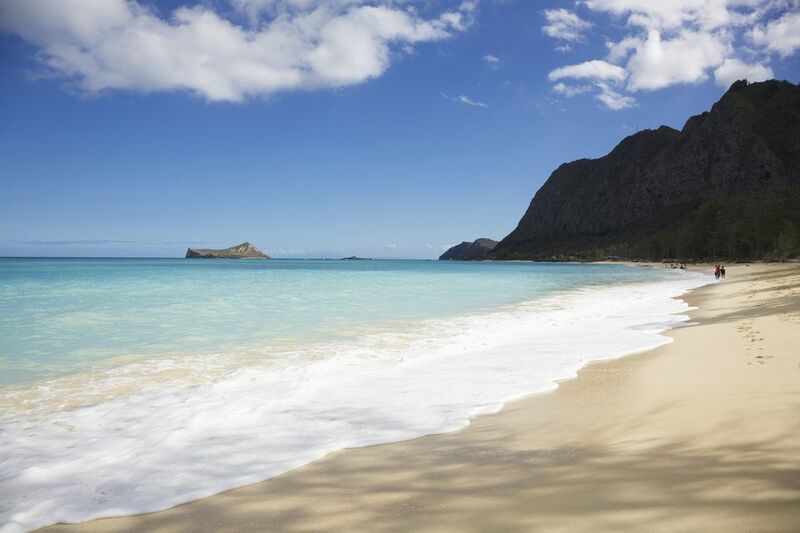 With a three-and-a-half-mile strip of white sand, Waimanalo Beach is the longest beach on Oahu. Popular with residents and tourists alike, the spacious plot is perfect for all sorts of beach activities. Makapuu Beach is the most famous bodysurfing and bodyboarding area in Hawaii. Makapuu is also one of the only beaches on Oahu where both bodyboarders and bodysurfers can surf together. This 1,000-foot-long, white sand beach is also known as the location for In Harms Way, a John Wayne movie. Summer months bring swimmers and divers to Makapuu Beach, while September through April is perfect for bodysurfing. Waves often reach heights of 12 feet and break several hundred yards offshore. Every beach surrounding Oahu boasts jewel-toned waters, varying from crystal blue to deep azure, and offers a variety of water activities and sports to challenge all skill levels and satisfy beachgoers. The West Shore (leeward side) has many spectacular beaches. The leeward coast is known for offshore fishing spots. Winter months see the large waves, which reach heights of more than 15 feet. When big west or north swells are running, waves at Makaha Beach provide some of the most spectacular and dangerous surfing found nowhere else in the world. Winter months find a lot of shoreline erosion due to the heavy surf. But with summer, the sand returns, creating a beautiful, wide beach and ocean conditions great for swimming and snorkeling. Nanakuli Beach is divided into two sections, Piliokahe and Kalanianaole, with a small Hawaiian homestead separating the two sections. The Piliokahe section is situated on a sea cliff above a small cove. During the summer, a small pocket beach in the cove provides a good swimming area. The deeper water is popular for divers and snorkelers. The Kalanianaole section is the most popular section. The beach is 500 feet long and 125 feet wide. The water is calm during the summer, making this a popular diving spot for novices.